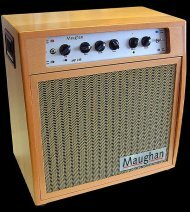 The Maughan Amplifier Company is a family-run business and was established in 2003 by Bernard and Vivienne Maughan with the aim of producing the highest possible quality amplifiers without compromise. Bernard has had over thirty years' professional experience working in industrial electronics, engineering and design. A keen musician and pianist himself, Bernard has always had a strong interest in audio and sound reproduction and built his first valve amplifier in the mid sixties as a schoolboy. Over the years Bernard has repaired and restored countless amplifiers for musicians from all over the country. Some of these amplifiers were up to half a century old and incredibly still working, and some, merely a year old, which due to modern manufacturing techniques and our throwaway society were uneconomic to repair and consigned to the scrap heap! At Maughan Amps we recognise the need to produce the perfect tone, that sound which can only come from the precise combination of wood, copper, glass and steel and an endless dedication to the pursuit of design perfection. We also recognise the need for quality, reliability and the trusting bond a musician must build with their amplifier, thus was born the Maughan Amplifier Company and this is our mission - Amplifiers Without Compromise. At Maughan Amps, instead of just looking at and replicating the old amp designs first seen in the 1950s and 60s, we have intensively researched wireless and electronics journals and texts from as early as the 1920s, re-discovering in the process a vast amount of 'lost' knowledge. Combining this with the latest CAD design and emulation technology, modern materials science and reliability engineering principles, we have created Maughan Amps and the project continues. We would like to thank all who contributed their expertise, ideas, friendship and support to this project: their continuing involvement remains invaluable. Thanks for visiting our website and please feel free to stay a while and browse.